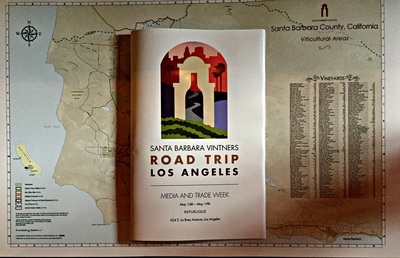 Day Three of the Santa Barbara Vintners Road Trip Los Angeles embraced Rhône grape varietals, specifically the two hottest trending wines in California in the past year, white Roussanne and red Grenache. Roussanne, relatively new to California, bewilders with its savory yet fruit-driven character, often sporting an oxidative, oily quality, not something you normally associate with a white wine. Grenache is more exuberant, with plenty of fruit and acidity, very good in blends but on its own, sometimes challenging in its excess or lack of complexity. 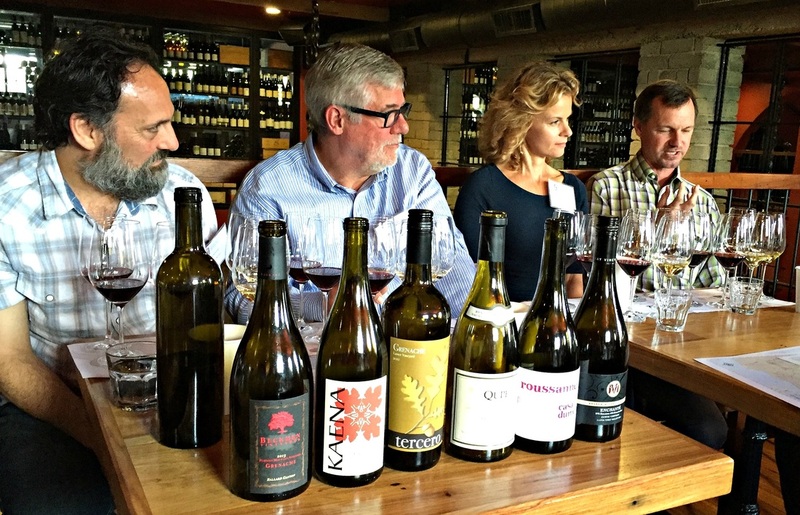 The Rhône Wine seminar investigated six wines from Santa Barbara County, three Roussanne and three Grenache, with six winemakers weighing in on the rewards and challenges of this relatively new sector of California wine. Andrew Murray of Andrew Murray, Sonja Magdevski of Casa Dumetz, Bob Lindquist of Qupé, Larry Schaffer of Tercero, Mikael Sigouin of Kaena, and Steve Beckmen of Beckmen contemplated their journeys, guided by writer Patrick Comiskey, whose passion and expertise is chronicled in a new book, “American Rhône: How Maverick Winemakers Changed the Way Americans Drink”. When you speak of Rhône wines, they can include single varietal wines such as Viognier, Syrah, Grenache, and Roussanne; or blends of red Rhône varieties such as Grenache, Syrah, and Mourvedre. Grenache has garnered the most buzz recently, popular in both red and white versions, with producers identifying the best vineyard sites in the state, as winemakers struggle to contain its vigor and encourage its aromatic complexity. Roussanne is an exotic, ambiguous wine, whose grapes are tricky to ripen properly, and still looking for an appreciative audience among California wine drinkers. Sonja Magdevski poured the 2013 Casa Dumetz Roussanne La Presa Vineyard Santa Ynez Valley, a 100% Roussanne wine. She recalled, “I was inspired to make Roussanne from Qupé and Bob Lindquist, I tasted a 10-year-old Roussanne, I had never had anything like that in my life, speaking of that elusive character and the nature of it, I was just curious to see what this grape would do.” Barrel-fermented in neutral oak, it’s textured, full body reveals ripe stonefruit and a mineral character, with balanced acidity bringing it all together. 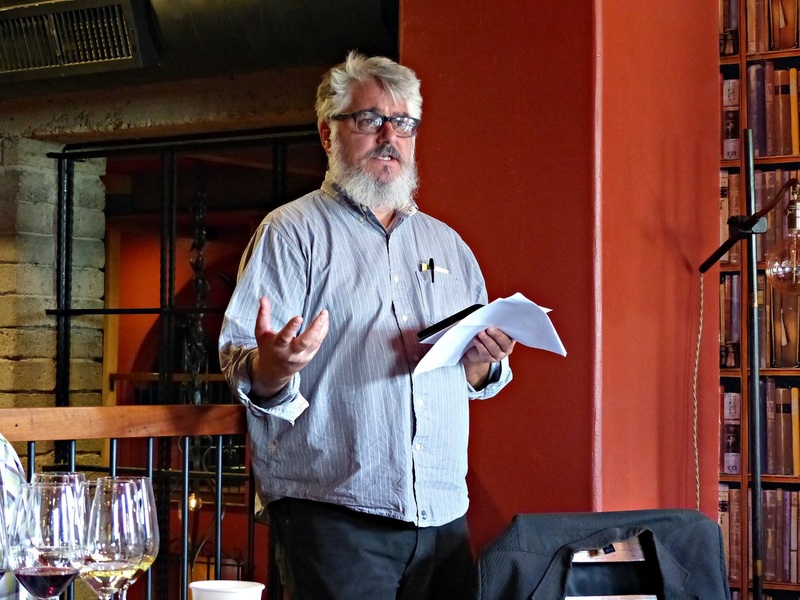 Bob Lindquist provided the 2012 Qupé Roussanne Bien Nacido Vineyard Santa Maria Valley as his interpretation of France’s Chateau Beaucastel’s wine, the inspiration for many of these winemakers. Lindquist makes his Roussanne very much like Chardonnay, fermenting it with the lees in 1-year-old small Burgundian barrels, then after racking and cold-stabilizing, returning it for additional aging in barrels before bottling. He notes, “2012 was a normal vintage, and the wine is just now starting to show its stuff.” A powerful and heady wine, layers of tropical fruit, apple, pear, and exotic floral notes intersect in the textured palate. 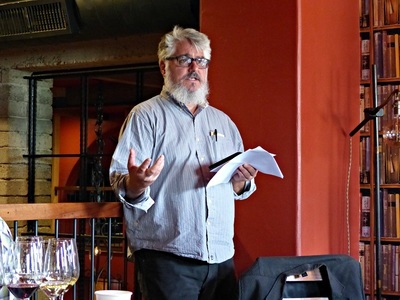 On Roussanne’s marketability, he said, “It’s not an easy wine to sell, it’s expensive to make. Top level consumers have no problem, but mid-level consumers, who spend $40 for a bottle of so-so Chardonnay won’t spend $40 for Roussanne. It’s our most important white wine, our most expensive white wine, it’s a pain to sell, but I love it.” And there lies the conundrum, it’s a weird wine for some, but an indescribably exotic wine that deserves the recent focus on its charms. Grenache has had a double life in California, according to Comiskey, first planted over 150 years ago, with only 6500 acres total, most of it found in the Central Valley, not a quality wine zone. An epiphany moment happened over 30 years ago, when Randall Grahm discovered 40-year-old vines in Santa Clara Valley, and the resulting wine inspired him to make American Rhône-style wines, starting with his flagship bottle, Le Cigare Volant. Since then, producers have experimented with the best vineyard sites and winemaking techniques to craft Grenache wines of character. Comiskey noted, “Most American Grenache is generally bright, vibrant, fresh, and inviting, it’s rarely something to contemplate, unlike the Rhône. American Grenache wines are often forward, energetic, like a large puppy that won’t stop jumping up and down. While you appreciate its exuberance, you may, in the end, prefer a little gravitas.” And because of this, Comiskey feels that this “front-loaded texture, and premature fruit delivery, is the best argument for blending in California.” Syrah and Mourvedre is Grenache’s most common companions, with Syrah bringing color, structure, depth, and length to Grenache’s acid and fruit. Larry Schaffer poured the 2011 Tercero Grenache Larner Vineyard Ballard Canyon. “To me, it’s my favorite Grenache that I’ve made up to this point. I think it really shows site, and it shows vintage, Grenache is really very similar in many ways to Pinot Noir in that it can be an incredibly transparent grape if given the opportunity. It shows clone, it shows site, and definitely shows vintage really clearly.” Schaffer notes that 2011 was a difficult vintage, cold weather marked by frost, with reduced yields, coming from Ballard Canyon’s sandy soils, where morning fogs extend the hang time on the vine. He only made 75 cases, aging in older French oak barrels for 30 months, “I wanted to keep them in oak longer, I wanted to build aromatic complexity, and I think that happens really nicely in oak with the micro-oxidation that takes place.” This is a bright, pure wine, full of acid, that needs time to breathe, vibrant but tightly wound, a great food wine. Mikael Sigouin supplied the 2013 Kaena Grenache Larner Vineyard Ballard Canyon. Unofficially known as the “Grenache King’ of Santa Barbara County, Sigouin is smitten with the varietal. “I live and breathe Grenache, and I am so head over heels with this grape. I always believe when I work with Grenache, it’s about respect, when you treat it right, handle it right, Grenache has the biggest payoff, for me.” This wine, also from Larner Vineyard, expresses the site, it’s sandy soils gives the wines a little bigger grip and intensity, yet Sigouin found the tannins were so big, he used French oak barrels, 20% new, to soften them and pump up the aromatics. Larner’s Clone 362 adds more color and deeper, dark berry fruit, and a little plum. Sigouin feels that Ballard Canyon is one of the most special sites for Grenache in Santa Barbara County, not too hot, not too cool, just right. Steve Beckmen brought the 2013 Beckmen Grenache Purisima Mountain Vineyard Ballard Canyon. He believes, “It’s all about how you farm and treat those vines, working with them to be successful.” He finds that Ballard Canyon, dry and windy, with Goldilocks temperatures, can yield many different wine styles. When the Beckmen family first started making Grenache over 20 years ago, they bought their grapes from Stolpman, “I knew immediately when we crushed those grapes and fermented them, the fruit expression, the spice, the pepper expression, the balance that the wine had between this kind of seductive texture and brightness and acidity, it just really connected with me.” Realizing the potential, the Beckmens bought the property next door to Stolpman, planting 40 acres of Grenache. At first, it was a lot of work, “We actually struggled with vigor on many of our Grenache sites, when it’s young, it wants to produce a lot of crop.” But as the vines have matured, the training and thinning have paid off. Comiskey explained, “Squelching Grenache’s natural tendency to grow huge crops is the only path to quality. It needs to struggle, in poor, well drained soils, it keeps the vines in balance and gives them a heady depth.” Beckmen agreed, “When you first start out, you don’t get everything right, but you get some things right, and when you do, you get this magical convergence of things.” And this wine reflects that, dense and robust, with red and dark fruit, spice, tobacco, and dark chocolate, mineral, voluptuous, and silky on the palate. Grenache and Roussanne are just two of the many Rhône varietals that thrive in Santa Barbara County, with great Syrah also coming from Ballard Canyon. Fragrant and savory, more producers are discovering how to coax complexity from Syrah, the ultimate Rhône grape, and craft beautifully balanced wines. It’s an exciting time to be drinking American Rhône wines, red and white, with some of the best coming from Santa Barbara’s vineyard paradise. Next up, Santa Barbara County Bordeaux-Style wines, with their interpretation of the classic Cabernet Sauvignon, Merlot, and Sauvignon Blanc.